RSOE Alert map, click on the image to enlarge. On Saturday I wrote, "with 16 major quakes from 17 occurring this year during coronal hole activity on our Sun and 14 of them along The Pacific Ring Of Fire and a similar amount of rumbling volcanoes, the coming days will most probably bring some fireworks, I would wager a major quake or two is a certainty." See here. 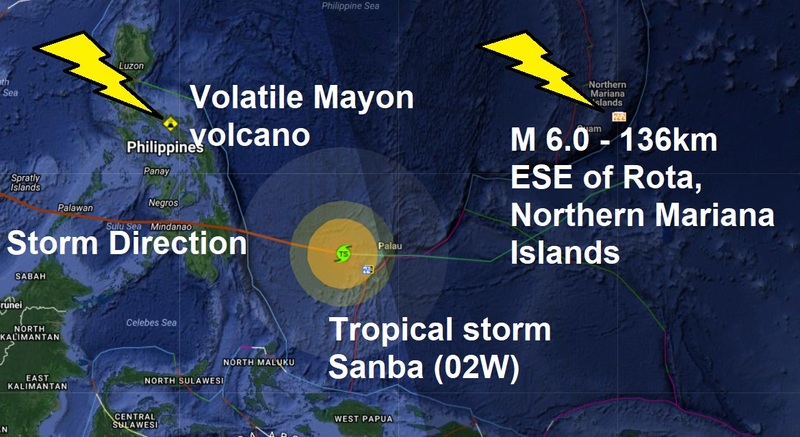 Right on cue late last night a magnitude 6.2, reduced by USGS to a 6.0, rocked the Northern Mariana Islands East of the Philippines in the general area of tropical storm Sanba (02W) which regular readers of The Big Wobble will be aware tropical storms, typhoons, hurricanes etc also influence earthquake activity. Close by another factor here is the very volatile Mayon volcano on the Province of Albay, in the Philippines which as we know has been sporadically erupting causing the evacuation of more than 60,000 people this year. This morning a mag 5.0, and a 4.7, south-west of Palau, occurred within miles of the storm centre and as Sanba heads NW passing close to the Mayon volcano it will be interesting as a coronal hole on the Sun turns to face Earth spewing a stream of high-speed solar wind possibly causing G1-class geomagnetic storms by Thursday. So far this year an impressive 16 from 17 major earthquakes have occurred during solar wind and or a coronal hole influencing the Earth's magnetosphere, 15 of them along The Pacific Ring Of Fire and a similar amount of rumbling volcanoes. Today's major quake is the 5th of February with all of them happening along The Pacific Ring Of Fire. Another area to watch is the South Pacific north of New Zealand where Cyclone Gita is active in the vicinity of Gaua Volcano Vanuatu Islands when a M 5.4 - 53km WSW of Ndoi Island, Fiji and a M 5.1 - 254km E of L'Esperance Rock, New Zealand struck late last night.